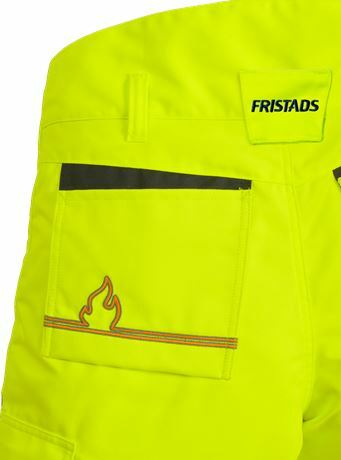 High vis certified winter trousers with inherent flame protection and CORDURA® reinforcement at knees. Adapted for ATEX environments with no metal details. Approved for industrial laundry. 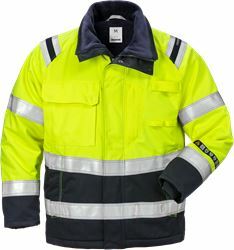 Material: Outer fabric 45% modacrylic, 35% cotton, 18% polyamide, 2% anti-static fibre, dirt, oil and water repellent. 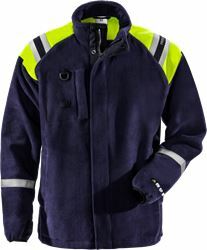 Reinforcement 79% FR cotton, 20% polyamide, 1% anti-static fibre. Silky quilted lining 40% modacrylic, 37% viscose FR, 22% viscose, 1% anti-static fibre. 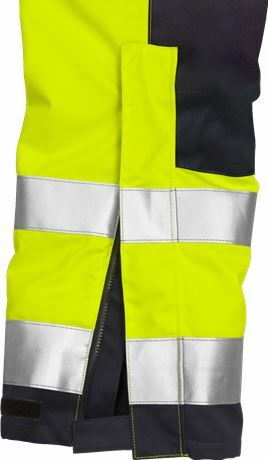 Weight: Outer fabric 300 g/m², silky quilted lining 260 g/m². 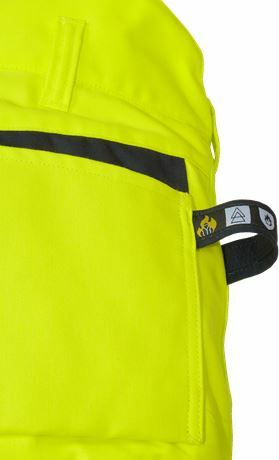 Dirt, oil and water-repellent / Fully lined with silky and soft quilted lining / Elastic detachable braces / Belt loops / D-ring / 2 front pockets with concealed zips / Double reinforced crotch seam / 2 back pockets / CORDURA® reinforced folding rule pocket with tool pocket / Leg pocket with flap and concealed snap fastening, phone pocket with flap and velcro fastener and D-ring with plastic ID-card holder / Pre-shaped knees / CORDURA® reinforced knee pockets with inside opening / Height adjustment for knee pads in knee pocket / CORDURA® reinforced thigh panel in contrast colour / Thigh pocket with flap and concealed snap fastening / Concealed zip up to knees / Snow gaiters / Adjustable, CORDURA® reinforced leg ends / Approved according to EN 14404 together with kneepads 124292, EN 61482-1-2 class 1, EN 61482-1-1 main fabric EBT: 26,4 cal/cm² HAF: 93,2% (see Electric arc table for certified garment combinations for EN 61482-1-2 class 2 and open arc according to EN 61482-1-1), EN ISO 11612 A1 B1 C1 E2 F1, EN ISO 11611 A1 class 1 (see Flame and welding table for certified garment combinations), EN 1149-5, EN 13034 Type PB  , EN ISO 20471 class 2 and EN 342 / Leasing laundry-tested according to ISO 15797 / OEKO-TEX® certified.